Indian wrestler Bajrang Punia clinched the first gold medal for India in the 65kg freestyle wrestling on Sunday. The Indian wrestler defeated Japanese opponent Takatani Daichi by 11-8. 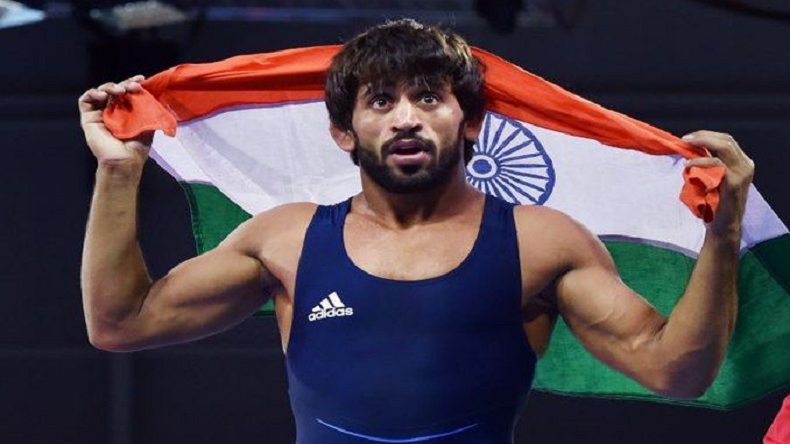 Indian star wrestler Bajrang Punia on Sunday won the first gold medal for India in 65 kg freestyle men’s wrestling at the 18th Asian Games. Bajrang Punia pinfall the Japanese opponent Takatani Daichi by 11-8. Bajrang Punia won all his matches on the way to clinch gold. First Uzbekistan’s Khasaanov Sirojinddin, Tajikistan’s Abdulqosim Fayziev in quarterfinals and Mongolia’s Barmagnai Batchuluun in semifinals. Bajrang Punia took only 1 minute 20 seconds to beat the Japanese opponent Takatani Daichi to bag the gold medal. Haryana’s Sports Minister Anil Vij announced to honour Bajrang Punia with Rs 3 crore for his great performance in Asian Games 2018.